At The Gates have released a video for their track The Colours Of The Beast. The song features on the band’s latest album To Drink From The Night Itself, which launched in May last year via Century Media. Vocalist Tomas Lindberg says: “This time we want to focus on the heavier, grittier sound of the band, hence The Colours Of The Beast. “We once again worked together with Costin Chioreanu on this one. We talked with him that we wanted him to try to capture the dark, gloomy side of the band‘s music. 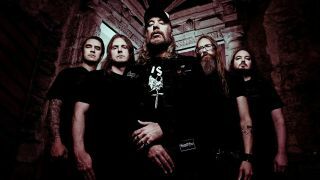 At The Gates played at the Roadburn festival over the weekend and will head back out on tour later this month.